I was just about to dismiss them when one boy did something that surprised me. He bowed his head and said a silent prayer. My seventeen fourth graders raced into the classroom, each trying to be the first to sit down. As soon as they were seated, I asked them to quickly pack their books and pencils. School would be over in 15 minutes, and I could see dark, ominous clouds rushing in from the sea. I didn’t want them to walk home in a storm. But the children didn’t listen. They were all talking at once, trying to tattle on who had misbehaved in a previous class. I reminded them to respect all their teachers and then asked them to quiet down so that we could pray before they went home. Still, no one listened. “Fourth graders, please look out the window toward the sea,” I asked. A few of them turned to look. “Can you see those dark clouds coming closer and closer to our school? Do you want to get home wet?” Suddenly it began to pour. That caught the attention of my little noisemakers. “No, Miss, we want to go home dry,” they responded loudly. When all was quiet, I asked the children to bow their heads and close their eyes. Then, as I do at the end of each school day, I asked Jesus to keep them safe, help them with their homework, and bless their families. Then I asked Him for something that my students had never heard me ask for before. I asked Jesus to stop the rain until they were all safely home. When I opened my eyes, I saw two of my students laughing. “Why are you laughing, children?” I asked. Silence fell across the room. My fourth graders knew that it was rude to laugh, walk, or even open their eyes when someone was praying because that person was talking to God. I knew that most of my students wanted to believe in someone that they could see and not someone they only heard about each morning in class worship. “Children, remember the Bible story that we read yesterday?” I asked. I stood looking at the children, not sure what to do next. I was just about to dismiss them when one boy did something that surprised me. He bowed his head and said a silent prayer. When the other students saw what he did, they followed his example. I silently asked Jesus to stop the rain so that the children’s faith in Him would grow. When everyone finished praying, I dismissed the class. It didn’t rain again that afternoon for a couple hours, and then it poured. The next day, the children who had walked home from school told me that they had arrived just in time. Many of my students come from non-Christian homes. I praise Jesus for this answered prayer because it helped the children to realize how much He cares for them. Their faith is growing, and they are learning to trust Him. And they aren’t the only ones. I think that the greatest blessing of my volunteer service has been that I, too, have learned to trust Him more. I now know that, whatever my circumstances, He will always be there for me. Viviana Gunua Damagoi Kumbia is from Papua New Guinea. 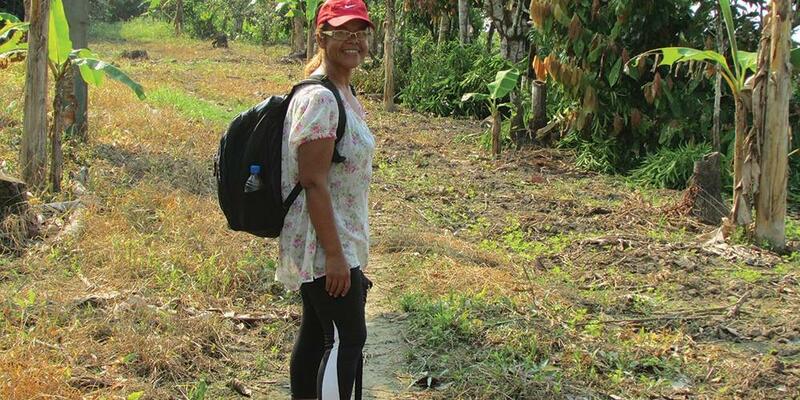 She has served as a volunteer teacher at Delap Seventh-day Adventist School and plans to earn a degree in primary education at Fulton College in Fiji.